Attend these amazing events during your stay in New York City. For all the Gin & Tonic lovers out there, we are hosting a special evening of G&T and pintxos tasting with Chef Jose Garces here at Ortzi Restaurant! From 5pm-7pm, experience Basque culture by sampling unlimited craft Spanish gins & tonics while tasting a variety of delicious, savory pintxos with Chef Jose and friends. 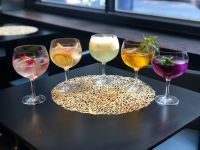 Discover fancy drinks from Saffron-Infused Gin to Cucumber Foam Zest and learn why Gin & Tonics are the beloved choice for everyone in Spain!